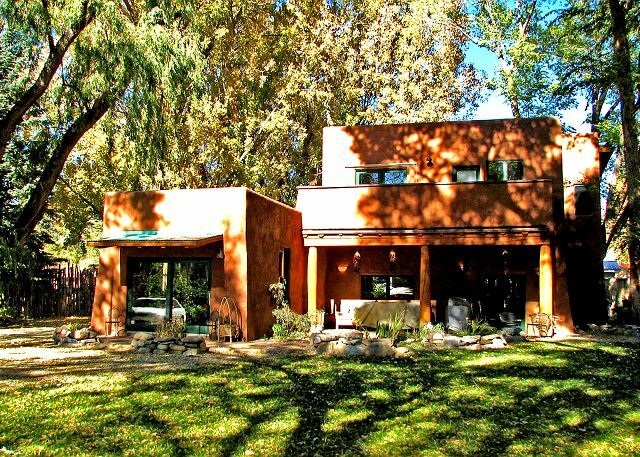 Adobe Arboleda - "House of the Grove" so named because of the lush ambiance of tall shade trees surrounding this magnificent home in the heart of town. Years ago, shortly after taking possession, former owners learned that an enormous 150 year-old willow in the back yard was dying. 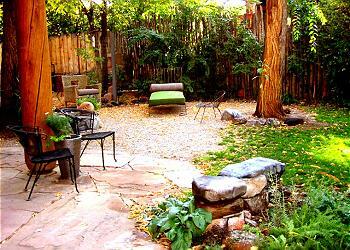 They stopped at no length or expense to save the precious tree and it stands today to thrill all who visit this oasis. To commemorate the significance, the owners commissioned a graceful image of "Safe Willow" to be carved on the door of the wine glass cabinet in the great room. 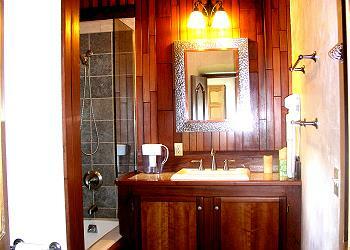 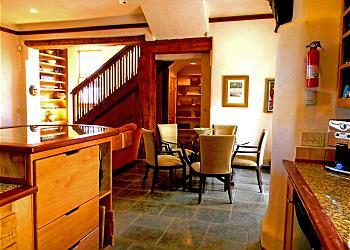 The cabinet remains for guests enjoy. Offering a lush private setting, expansive tree-shaded yard / lawn and in the heart of town off historical Kit Carson Road. As an added bonus the completely enclosed yard is surrounded with Aspen latilla fencing and gate. 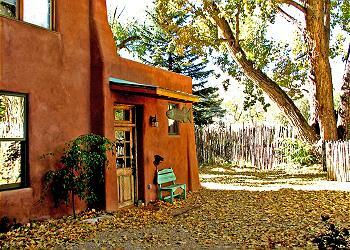 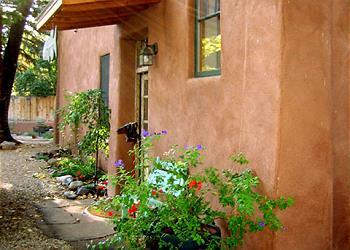 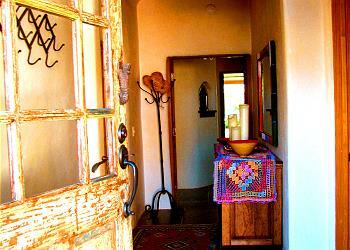 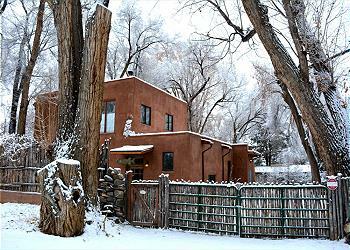 Such enclosing, so popular in Santa Fe and Taos, is fondly called "Coyote fence". 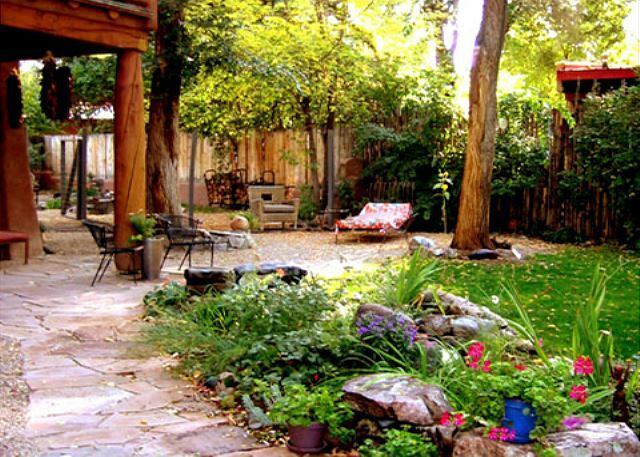 Spring, summer and autumn are special months for enjoying the upscale patio with giant "portale" (Spanish for "covered patio and/or walkway) for extended outdoor living. 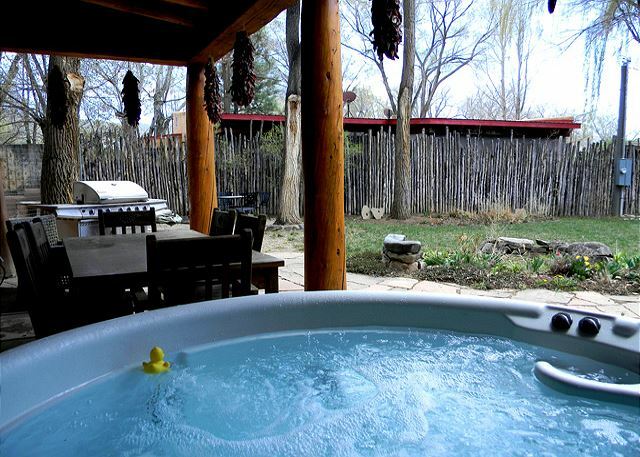 Furnished with large upgraded stainless gas grill, large patio table and Hot tub, guests have all the makings for 8 months of outdoor dining and entertainment and 12 months of relaxing and soaking in the hot tub. 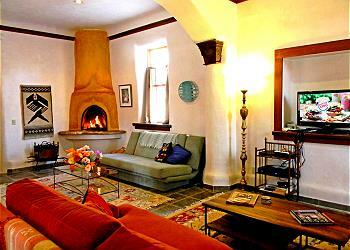 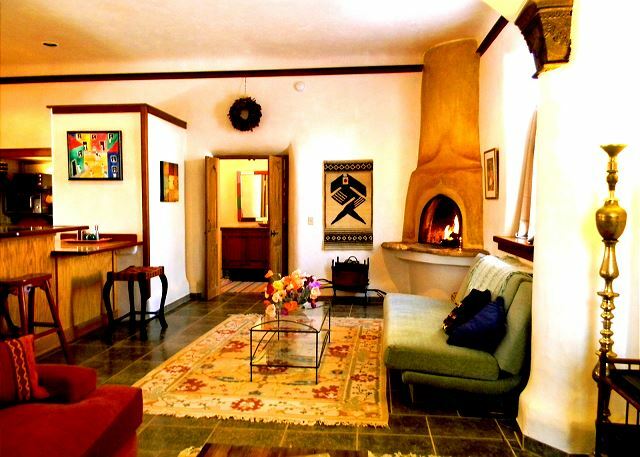 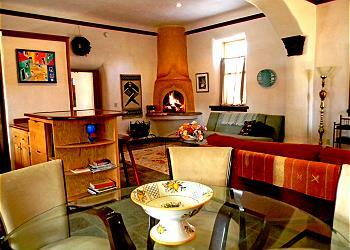 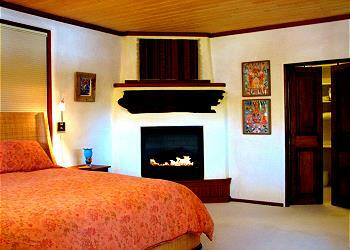 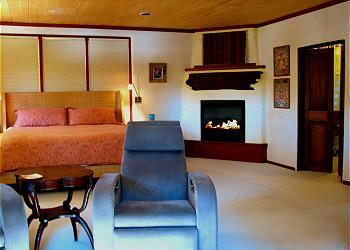 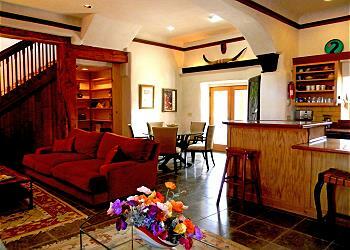 The century old completely renovated adobe has a wood burning Kiva fireplace, hand-hewn vigas, and radiant-heated floors. 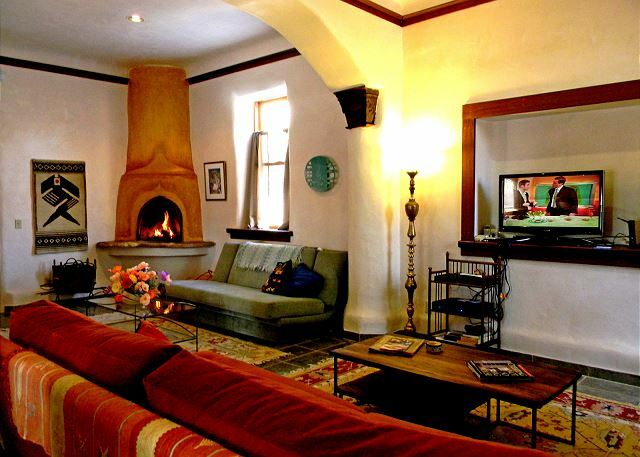 The hand-trowelled plaster nichos and alcove ceilings enhance the entire home. Included in the great room is the custom designed gourmet kitchen boasting pull out drawers that house stainless cook ware and appliances. 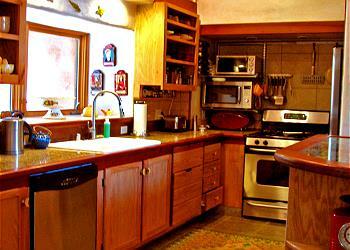 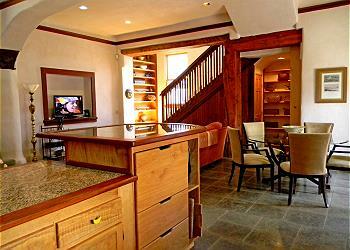 Granite counters, hand crafted cabinets and well stocked condiments will delight foodies. 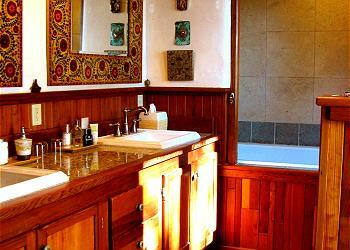 Many upscale luxury touches throughout this gracious home enhance this rare, private, secluded in town oasis. Situated directly across the road from award-winning El Monte Sagrado resort, restaurant and lounge, this luxury Taos vacation rental is a five minute tree lined walk from Taos Plaza. 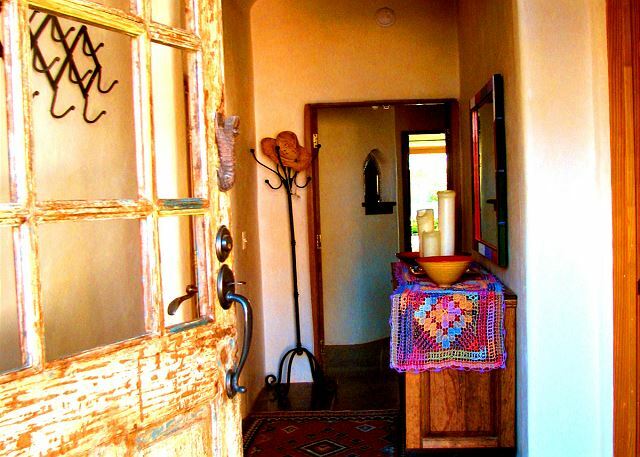 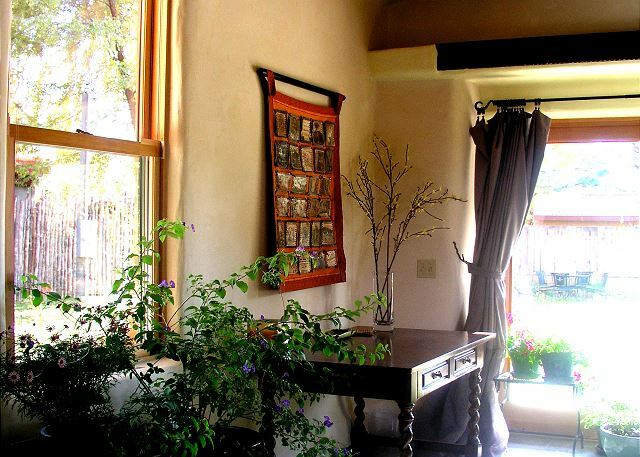 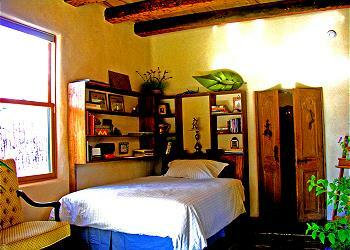 One Taos vacation lodging experience at "Adobe Arboleda" is guaranteed to please and have you dreaming to return to the magic of Taos.